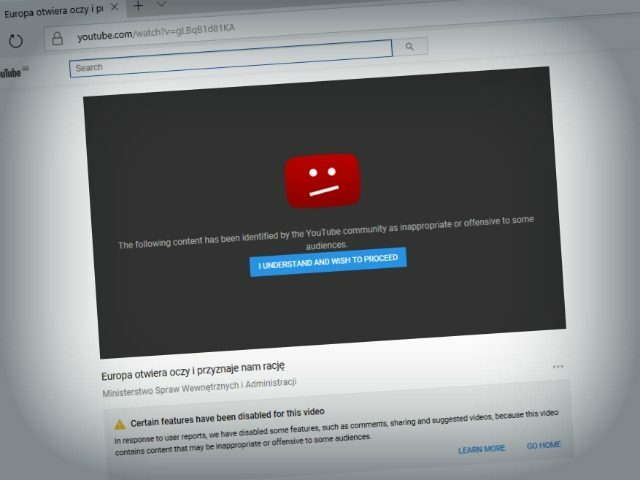 The Polish Ministry of Interior and Administration’s video has been placed in a controversial state designed by YouTube to limit access to videos it says contain “supremacist” or “extremist” content, but which don’t break any of the platform’s rules. Opening with dramatic scenes of migrants swarming into Europe, the video highlights EU leaders’ insistence that the newcomers be spread throughout the continent and forced even on unwilling nations through compulsory quotas. But YouTube has now placed the powerful video in “limited state” — a condition designed to severely reduce the potential audience for “borderline” content. Videos placed under this system are unsearchable, impossible to embed on other sites, and removed from users’ recommended videos lists. The only way to reach ‘quarantined’ content is by clicking a direct link to the video in question, at which point viewers are warned that the “content is inappropriate or offensive”, asking them to click a button before they are allowed to proceed. YouTube has also shut down comments on videos which have been placed in this “limited state”, and removed view counts and up-votes and down-votes, making it impossible to see the reach of the video or know how it has been received. YouTube Will Censor Non-Rulebreaking Content, Manipulate Search Results, And Work With ADL. Google unveiled the policy in August among a raft of new measures which the video-sharing website said it will use to counter “extremism”. It announced a partnership with 15 “expert NGOs and institutions” — including the Council of Europe’s left-wing No Hate Speech Movement and George Soros-linked groups — who will direct them in identifying objectionable content.